Offering a day to the sparrows, which were a common sight in our backyard and markets is to avoid a dismal picture with none of them being spotted over time. Spotting them now gets at least a few of us nostalgic considering the tiny grey beings getting scanty in number. Coming in like a flock, their chirpings were what we woke up to a few years back. The adverse effects of heavy urbanization have led their numbers to dwindle at an alarming rate. These feathered friends who have evolved with the human kind were not exotic. Spotting them now has become a rare sight, having even managed to enter the list of endangered birds. That calls for action. Observing and knowing them is the best way to take care of them. Though folktales may not provide you with scientific measures to increase the declining numbers of these winged companions, they let you understand what was around you and what you have missed out over the years. Forming a vital part of every culture around the world, reading folktales will definitely give you an insight into the nuances of a place, geography framing the crux of these tales. 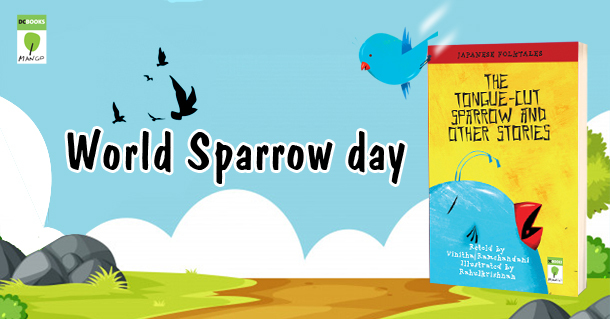 As we observe world sparrow day, read a story about a magical sparrow in The Tongue-Cut Sparrow and Other Stories, written by Vinitha Ramchandani. Let the winged beings give a glimpse of themselves through these tales while we strive to figure out ways to bring their chirrup back to our backyards.